but by the content of their character. I have a dream today! 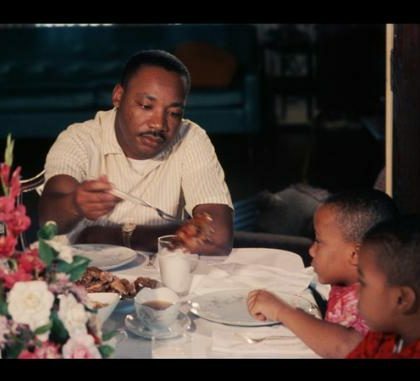 Dr. Martin Luther King, Jr. would be 86 years old now had his life not been ended by violence in 1968. For those who shuddered at the vision he had the courage to share with our nation during his ministry, his death no doubt was an illusory moment when they thought they had silenced him. But Dr. King’s voice and his words continue to reverberate through the soul of America as we struggle still with what it might mean to heal the wounds that racism has wrought among us. Dr. King’s words and courage have always inspired me in my life as a justice-seeking white person. He described the pulse of a movement that changed the texture of my life as a child of the American South. He gave me words to understand the urgency and the potency of working and risking for justice. Indeed he is an icon for me of living a life of Christ-filled purpose, of making sacrifices for a better world, of telling the truth even when it cost him dearly. It is that spirit of purpose, sacrifice, and truth-telling that I strive to hold onto in my own life, in my own ministry. So much of my work is born of the vision God holds out in front of me of a world healed from the ravages of racism. Part of living into that vision means that I have had to risk telling my own truth about my whiteness, about my privilege, and about the ways I have both been distorted and profited by the way race functions in this country. But the important lesson I have learned about these words is that we whites have misunderstood them. And being colorblind is absolutely NOT what we need to be anti-racist in 2015. And I believe, with everything that is in me, that Dr. King, too, would agree. The colorblind aspiration that progressive whites have espoused is a dangerous invitation—and more and more, it is jarring to my ears. It sounds more to me like an invitation for people of color to act white than it sounds like creating space for us to honor who people really are, where they come from, who they are becoming. And it lets us white people off the hook—after all, whiteness is the absence of color. So, if you are white and you don’t see color, then you don’t really see anybody who doesn’t look like you. Surely we can be more careful with the words of a dream from a man who challenged us to see the world anew. He challenged us to move out of our destructive mentalities of racial inequality toward a world where we honor the humanity, the beauty, the possibility of every human life. He urged us to make our laws and policies reflect our collective values of freedom, liberty, and justice for all. Surely we can take great care with this dream of his—and hear the substance of his call to really see one another. He wasn’t asking us to not see the color of his four children’s skin—he was asking us not to attach hatred, biases, assumptions, fear, and judgment to the fact that their skin is black. He was asking us to see them as whole people—as complicated, as promising, and as brilliant as all children are when their lives stretch out before them. He was asking us to dream with him of a world where the fact that their skin was black would not put them at an immediate disadvantage, would not put economic, legal, and social obstacles in front of them. The hard truth is, my fellow white people, that our mistaken interpretation of Dr. King’s word as license and encouragement for colorblind laws, policies and habits has not healed us from racism’s disease. This colorblind mentality has exacerbated many of racism’s worst effects. This colorblind mentality has made us blind to our own privilege and distorted our capacity to see how race still deeply influences the contours of lives and communities in this country. On this holiday honoring a man who has taught me and taught us so much about who we are and who we can be, I want to honor him by continuing to train my eyes to see the vivid colors and contours of each person that I have the privilege to meet. May I have the courage to see my own true colors, too. And may we see ourselves in 2015 with a rich palate of truth, the kind that can finally set us free. *I posted a version of this blog on Martin Luther King Day in 2013. I am reposting today with just a few edits because the invitation for whites to take a more critical look at our “colorblind” aspiration is even more pressing as 2015 gets underway. Thanks so much for reading and for commenting. And thank you for sharing some of your story around how race has affected your life. I would love to hear you say more about how hearing each others stories made “the colors disappear.” I am wondering what meaning that holds for you. Have you ever talked to your roommate about the dynamic you describe? I wonder if she would describe that dynamic similarly or differently. What assumptions about race did the two of you come to your relationship with and how did those change for each of you? There is so much to explore–I hope you will. And if you feel like sharing it, please do!